WE'RE GOING ALL OUT! Our Sneak Peek Is A Guaranteed PARTY! 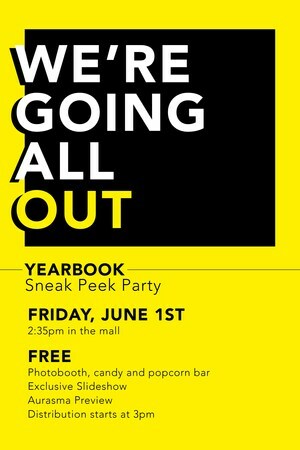 YEARBOOK Sneak Peek Party - June 1st @ 2:35 PM in the Mead Mall. Photo booth, candy and popcorn bar, exclusive slideshow, aurasma preview, and distribution starts at 3pm!